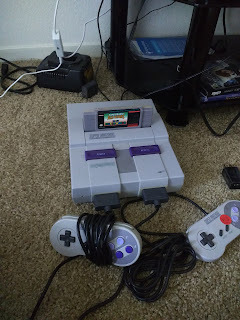 My actual for real Super Nintendo. I have a 2DS somewhere, but other than that, not counting my PC, I haven't had a modern console since I had a Nintendo Wii. But last year, I just had a moment. Super Nintendo Classic had been announced, and then it sold out almost instantly. "I bet I could buy a real Super Nintendo for cheaper," I had thought, "and it'll be more fun." True to both. But setting it up was such a process. See, I couldn't get the SNES to work on my modern day HDTV. I tried so many ways, but it wasn't destined to be. Until I went to Goodwill and bought a $10 DVD/VCR combo. A DVD player can work with an HDTV, and a SNES can work with a VCR. It was the missing link that I needed. But I love having a Super Nintendo. I only have 13 games right now, plus a Super Gameboy and three Gameboy games, but I plan on growing my collection. The more complex video games got, the less fun they were for me, anyway. So the more expensive consoles got, the less it was worth it for me. I'm just fine with The Legend of Zelda: A Link to the Past, Super Mario World, Paperboy 2, Where in Time is Carmen Sandiego, Turtles in Time, and others. It's 25 years later, and they're still fun. I still have fun. That isn't to say that I never plan on having another console. Besides price, the reason I haven't had another new console since the Wii is because while my family was playing New Super Mario Bros, my brother told me that if I made him die one more time in the game, he would decapitate me in real life. Same brother who never got that mad when I took a pizza he needed in Turtles in Time. The magic is gone. I'm just holding out for the console that feels fun again. Who knows when that will be. But if I do ever get around to having my own little Alphas, they're definitely playing some Paperboy 2 on a real Super Nintendo. It's just good family fun.